Our automatic screwdriver control systems encompass the range of available state-of-the-art control, monitoring, and statistical analysis capabilities. We provide any combination of torque, angle, time, and depth; along with data collection, storage, and analysis. We would be pleased to submit a quotation on a package that meets your automatic screwdriving requirements. Please contact one of our consultants by E-mail, or call us at 317-776-1970. 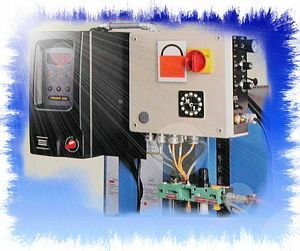 MCI/Screwdriver Systems' vast product line includes Automatic Screwdriver componts up to and including complete turnkey Lean Manufacturing Cells. We also offer in-house refurbishing, upgrading and re-manufacturing of any existing automatic screwdrivers and systems. We also have immediate availability of replacement parts for every system we produce and for many of our competitors. With MCI your needs are covered; no need to buy a part here, a feeder bowl over there, controls from yet another supplier, and the automation to make it work from yet another. We're not just integrators; we're creating the system from the ground up! We can help with more than just automatic screwdrivers. MCI/Screwdriver Systems porvide controls for more than Automatic Screwdrivers. 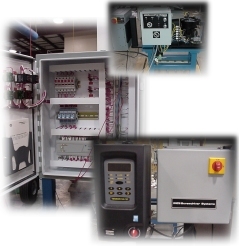 We also provide complete control systems for Mechanisms, Lean Cells, and Polycast Vibratory Parts Feeder Bowls - the foundation of our vast product line of part handling systems. The name "MCI/Screwdriver" is synonymous with automatic screwdriver systems and Polycast vibratory feeder bowls. With years of experience in automatic screwdriver business, MCI/Screwdriver Systems has defined, refined, and patented numerous innovations designed to make life easier for our customers that rely on quality automatic screwdriver and Polycast vibratory part handling systems. As one of the few automatic screwdriver companies large enough to do so, MCI/Screwdriver earmarks a portion of its budget every year for research and developement. Your needs become our challenges, and we have the team in place to face those challenges head on! For example, in addition to Automatic Screwdrivcrs, we developed our Custom Lean Cell systems specifically to overcome the inherent difficulties in handling, feeding and orienting parts that can be handled at a work station rather than fully automating it online. Our systems are capable of providing a constant flow of work output. Our design team created the patented Polycast® Vibratory Feeder Bowls to accommodate a wide range of off-the-shelf feeder bowl tooling to provide a quick change of tooling across part families. We have packages in stock at all times to address common feeding issues, such as screws, nuts, washers, bushings, o-rings, and dowel pins. Just imagine, a feeder bowl sitting on the shelf, waiting for tooling (also on the shelf), to be placed into immediate service in your application. These vibratory parts feeder systems can be ready for use in a matter of days rather than weeks! We even address you sticky part qualification problems; such as, separating similar or dissimilar parts from the part you are actually looking for, thread presence, part lengths and diameters, even sorting several different parts into discrete chutes. Contact one of our consultants to see what we can do for your production challenges. To complement our automatic screwdriver and lean cell product line we also offer a vast array of complementary components such as vibratory Polycast vibratory feeder bowl line we also offer optional support components such as vibratory feeder bowl drive units, vibratory tracks tooled to convey your part from either a vibratory or centrifugal parts feeder, orienting rolls, feeder bowl controls, bulk hopper to meter your parts into a vibratory or centrifugal parts feeder, floor or linear parts feeders, sound enclosures to lower the sound level of the vibratory or centrifugal feeder bowl. MCI/Screwdriver also provides single station assemble mechanisms complete with pneumatic and electric automatic screwdrivers that assemble fasteners tracked from vibratory and centrifugal parts feeders or we can provide just the receiver head portion of an automatic screwdriver application allowing the user to design his own assembly mechanism.